footnotes: Edward Allcard is alive and well and living in Andorra. The Ciutat Badalona, ex-Johanna Regina, sailing off Badalona. Over the last half-century or so sailors have been sailing long distances in small boats on a regular basis. It is now considered a perfectly normal endeavour and that even going solo is a sane thing to do. But, it was not always so. In the late 1890s Joshua Slocum had led the way with his solo circumnavigation and there had been a long lag before Harry Pidgeon followed in his wake. There was another lag after Pidgeon but then throughout the twenties, thirties and forties the numbers of intrepid sailors who took up the call slowly increased. There was a sort of Golden Age of small-boat voyages. Some of those sailors are long forgotten having left little or no records of their adventures. But others thought that long-distance sailing would be of sufficient interest that they wrote books about their adventures; among them, W.A Robertson, Alain Gerbault, Vito Dumas, Eric and Susan Hiscock, Ann Davison, Humphrey Barton, Adlard Coles, and Edward Allcard. These sailors promoted the cause of long-distance sailing, and of an alternative way of life, with their published accounts, and they led the way to today's explosion of cruising under sail. Those pioneering sailors are all gone now except for one. Edward Allcard is alive and well and living in Andorra. Allcard was born in England in 1914 and learned to sail dinghies from an early age. He qualified as a naval architect prior to the Second World War. He made his first single-handed voyage in 1939 sailing from Scotland to Norway and back. In 1948 Allcard set off to cross the Atlantic from England to the United States aboard a 35-foot ketch, Temptress a boat that had been previously sailed by Humphrey Barton. His account of that voyage was published as Single-Handed Passage. His return across the Atlantic resulted in a marriage to a beautiful Azorean stowaway that was noted in the international press of the time. Allcard recounted that story in his book Temptress Returns. In the late 60s Allcard refurbished a fifty-year old boat Sea Wanderer in which he set out to circumnavigate at a leisurely pace. It took him 16 years to complete that voyage. During the 1970s he and his second wife Clare discovered a wooden 70-foot ketch in the Caribbean. They repaired the derelict Johanne Regina and with their daughter sailed it across the Atlantic to England and Europe. Eventually the Allcards sailed the length of the Mediterranean and down the Red Sea to the Indian Ocean and later to the Far East. In this case it was Clare Allcard who wrote about their adventures aboard Johanne Regina in a book entitled The Gypsy Life published in 1992. Some time ago the crew and supporters of the sailing vessel Ciutat Badalona gathered in the small auditorium down by the port of Badalona, a Catalan town just northeast of Barcelona, to listen to a presentation by Clare Allcard. The gathering was a celebration and presentation of the Catalan translation of The Gypsy Life published under the title of Rodamons de la Mar. The significance of the Catalan translation of Clare's book is that the Ciutat Badalona is the former Johanne Regina. 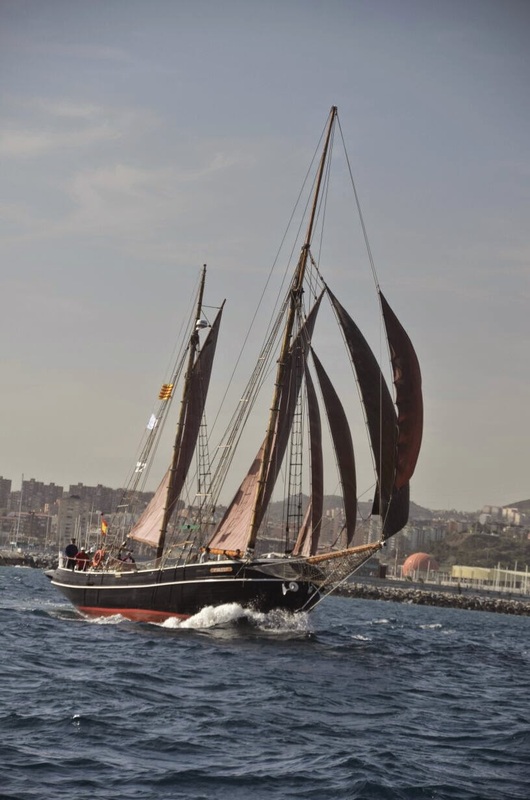 The Ciutat Badalona is now owned by the city of Badalona and serves as a sail training vessel. When the Allcards sold their vessel in 2006 they retired to Andorra, a small independent state, straddling the French-Spanish border in the mountains of the Pyrenees. The official language of Andorra happens to be Catalan, also the lingua franca aboard Ciutat Badalona. So when Clare made her presentation in Catalan it was much appreciated by those in attendance. During her talk Clare recounted some of the anecdotes that readers of the original English edition of her book would already be familiar with but she also added some others not in the book. She did express her appreciation to what has happened to the Johanne Regina since the Allcards had sold her. Realizing that she and her husband were getting too old to manage such a large vessel—Ciutat Badalona is 24.07 metres LOA and 70 tonnes displacement—they sailed to Catalonia and moored in Torredembarra harbour near Tarragona while they set up their retirement home in Andorra. Johanne Regina was moored for ten years in Torredembarra while Edward frequently and faithfully drove down from Andorra to attend to her maintenance. For a long time the Allcards feared they would not be able to sell the vessel and that she would have to be abandoned and scrapped. At some point during her long stay at Torredembarra the Johanne Regina caught the attention of Marcel Mongay and Maria Mascarenas who befriended the Allcards. Marcel, a retired merchant marine captain, and Maria had a vision for the vessel of which they tried to convince the Badalona city council. Like most towns and villages along the Catalan coast Badalona has a rich maritime tradition and it was the intention of Marcel and Maria to not only preserve that heritage but to somehow bring it to life. They wanted the city to buy the Johanne Regina and to convert her to a sail training vessel to be based in the municipal harbour. It took some convincing of the mayor and councillors but in 2006 the sale was completed. With Marcel and Maria aboard, the Allcards sailed Johanne Regina up the coast to Badalona. As Clare writes in the epilogue of the Catalan translation, “the Johanne had found a new home.” The Allcards never expected that the vessel would become a sail training project for a group of aficionados. The Ciutat Badalona, ex-Johanne Regina, is a Baltic Sea trading ketch built in Faborg, Denmark, in 1929. The vessel was originally named Marie and she was typical of small coastal trading vessels built at the time, she hauled potatoes to the market in Copenhagen. The Marie was launched without an engine but provision had been made for the future installation of one—she now boasts a 400 horsepower diesel. The ketch rig was typical of these vessels, handy for a small crew, and I am reminded of the coasting and fishing schooners of the Canadian Maritime provinces from the same era. The Marie changed hands in the late thirties and was renamed Johanne Regina but continued at her trade of hauling potatoes even during the war. Later she somehow ended up in the Caribbean working as an inter-island trader. When the Allcards found her Antigua she was in a much dilapidated state. Now the Ciutat Badalona is looked after by a group of volunteers under the auspices of the Associació Amics del Quetx Ciutat Badalona (Association of the Friends of the Ketch Ciutat Badalona). Many of the volunteers are older retirees who perhaps are making up for missed dreams of sailing when they were young. The “friends” sail Ciutat Badalona on a regular basis throughout the year. In the fall of 2013 she participated in the Tall Ships regatta from Barcelona to Toulon and La Speciza gaining a third place in one of the legs for her category. The volunteers undertake maintenance of the vessel and Clare says that Ciutat Badalona has never looked better. Like any wooden vessel of this size she needs a fair amount of attention. She spent several months out of the water during the winter of 2012-13 which allowed for attending to much of her woodwork below the waterline. Still more work goes on. The main top mast was replaced after the old one broke in a moderate breeze. Just recently rot was discovered in the bowsprit and it had to be replaced. She could use a new suit of sails meanwhile her existing suit of Lucas & Sons sails is repaired as needed. On the other hand Ciutat Badalona's a new diesel engine is looked after by a fanatical cadre of volunteers some of whom happened to be retired mechanics. Also in attendance at the presentation of Clare's book was Edward. It was Clare's night so Edward stood aside. In October 2014 Edward, hale and hearty, celebrated his 100th birthday with his family and friends at home in Andorra. Queen Elizabeth sent a note expressing her best wishes. Edward is part of a small brotherhood of the sea whose exploits have inspired other sailors. Today ocean crossings by small vessels are common place. Every year hundreds of vessels cross the Atlantic and circumnavigations are now so common that they have lost their news worthiness. Although Edward and Clare Allcard have now retired, and living in the Pyrenees far from the seas, their books will continue to inspire others in following in their wake. Meanwhile their old ship will be teaching and developing new sailors. The author speaking with Edward Allcard. It was Clare's night so Edward stood aside but I did get the chance to briefly speak with him. I had hauled down my copies of Single Handed Passage and Temptress Returns and he was kind enough to sign them. I also had my copy of The Gypsy Life and bought a copy of Rodamons de la Mar which Clare also signed. Edward mentioned to me that he had recently finished writing another book, presumably the second part of his account of his traverse of the Pacific back in the 1960s the continuation of his 16-year long solo circumnavigation aboard Wanderer. Is it possible to contact Edward Allcard by email? I am trying to track down a boat that he raced against in about 1957. Just been reading through this blog and have a few little corrections to make. My husband, Edward and the Azorean stowaway, Otilia, never married causing much shock/horror at the time. They actually went their separate ways soon after making landfall in North Africa but in 2009 we caught up with Otilia through the Internet and spent Edward's 95th birthday with her and her husband. They live just four hours drive away! Edward's first wife was called Michelle. My book is actually called A Gypsy Life not The... We actually moved to Andorra when we arrived in Spain from the Far East in 1986 after a year living in Turkey. But for the next 10 years Edward spent much of his time on board Johanne whilst moored in Hospitalet del Infant while I commuted most weeks between Andorra and the boat. Then we moved Johanne to the new marina of Torredembarra and spent another ten years moored there, endlessly taking care of her maintenance. I don't believe we ever despaired of selling her but I had always dreamed of her becoming a sail training ship and, thanks to the Amics del Quetx Ciutat Badalona, my dream has come true. Am so pleased to hear that Edward is still active and a centenarian + !! !I am an 83year old ,still active too!